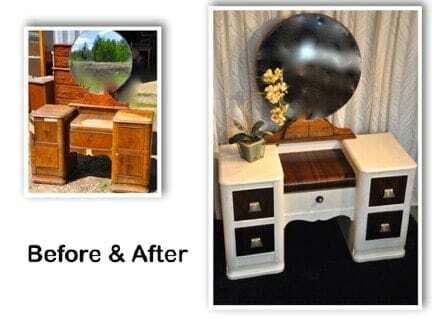 Buying Reloved Furniture is Great for Our Environment! We are all familiar with the phrase reduce-reuse-recycle, but did you know they are placed in that order for a reason? Once you understand the reasoning behind this order it makes total sense. First and foremost we must reduce, where we cannot reduce, we must reuse. Finally, if we really need to buy something and simply can’t reuse it, we recycle and only as a last resort. 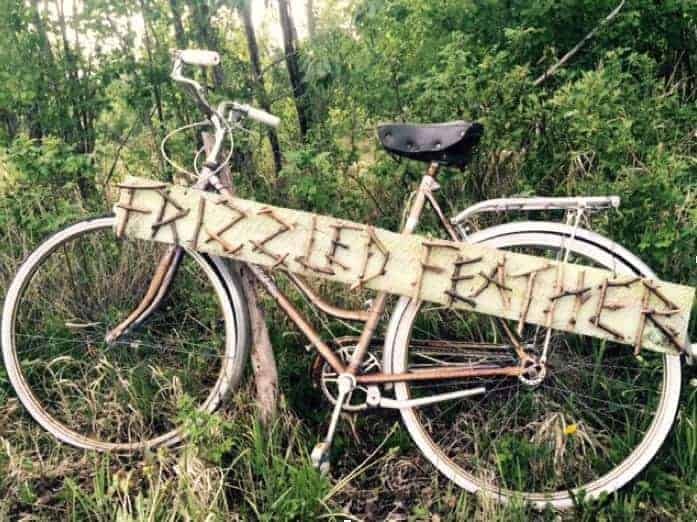 Frizzled Feather has a few suggestions to help you do your part for the environment, save money and keep on point with the latest trends in home furnishings and decor! Reduce– reduce what you buy and lower the amount of trash that needs to be disposed of in our landfills. Instead of buying that relatively inexpensive big box store piece of particleboard furniture, think about its life expectancy. Will it last as long as you want it too? These days we’re lucky if some of the furniture we buy new lasts as long as the time it takes to put it together! Will it be of value to someone else after you’re finished with it? Can you pass it on to your children when they move out on their own? If the answer to any of these is “no” maybe you should stop and rethink your purchase. But what, you ask, is the alternative if you don’t want to take out a second mortgage to furnish your house with quality, stylish pieces? We have a great suggestion. 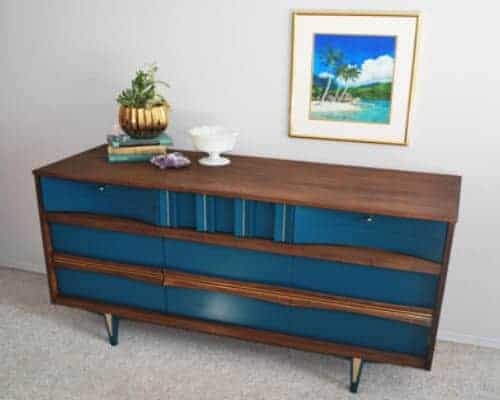 Have one of your existing pieces restyled by a local furniture artist to fit your current décor! This choice can prevent that solid wood dresser with peeling veneer or that vintage scratched up dining room set with the three wobbly legs from filling up our landfill. After a few repairs and some professionally applied techniques these pieces can be restyled into a gorgeous statement pieces that will be the subject of “oohs and ahhs” at your next family gathering. This dresser was in mighty rough shape. 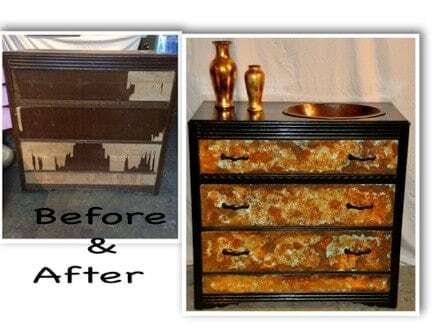 A little paint and tung oil turned his life around! Reuse items instead of buying new! Buy second hand. When I was a kid I was mortified whenever my mom bought me something from a dreaded second hand store. Back in the day the rule was you were never to be seen near a thrift store by your peers, let alone shopping at one! Times have changed for me these days. Now my mother and I can be found scouring every second hand shop we can find. I have learned the value of a quality piece of furniture or an older piece of home décor that will look fabulous in my home – and the value of not paying retail for it. It is unfortunate many in our society shun shopping second hand, and for those who do, they certainly do not advertise. For some of us it continues to have a certain social stigma attached to it. Now imagine the positive environmental impact, if in addition to reducing what we buy, we also reused on a regular basis?!! Do not let the stigma of “second hand” prevent you from owning a quality item. Purchasing a solid wood dresser, coffee table, buffet, china cabinet or a super cool lamp, etc. and having it refinished at a fraction of the cost of quality new piece will enable you to contribute to this noble cause. The piece will suit your decor perfectly and, because it is well constructed, it will last long enough to pass down to your children. All Viktoria here needed was a bit of stain and paint and she now is a trendy addition to her new home! Perhaps you don’t even have to search for an item, you may already own it and are thinking of donating it. Stop and give this some thought. We find that many people inherit their parent’s or grandparent’s furniture and have no idea what to do with it because it doesn’t fit their decor. Chances are pretty good your grandmother’s bedroom ensemble is constructed with more craftsmanship than many made today. If it was manufactured prior to the 1980s that set is probably Canadian made and solid wood! Do yourself a favour and keep it- have it restyled. A bit of work at the hands of a talented furniture artist and Grandma’s set will look as good as new, perhaps even better! If this doesn’t work for you, by all means donate it – or sell it to us and we’ll take care of it! Hayworth here was on death’s doorstep. This beautiful Art Deco piece was definitely worth saving! Recycle – lets face it, you cannot recycle everything but you can try to do as much as possible. Recycling is really the last option that should be considered. Oftentimes we think we have done our part simply by sorting and making sure we put recyclables in the “recycle” bin. This is all good and fine but many of us may not realize, even though it is being sent to be recycled it often has to be broken down and shipped by truck across the country (sometimes across the world) to be processed. This is a very expensive, energy consuming process and in many instances, not feasible. This is the reason different municipalities and counties have various rules in regards to what they recycle. In many municipalities wood products are simply burned or buried. As far as furniture goes, in our little business we try our best as to keep any of it from heading to the landfill, but there are times when some pieces are truly beyond repair. We strip all reusable hardware and the parts that can be utilized and use them create a new piece. For instance, we once used half a table to make a totally awesome craft table! We honestly cannot remember the last time we “trashed” something. Intercepted on his way to the dumpster. We transformed this guy into a bathroom vanity fit for a king! 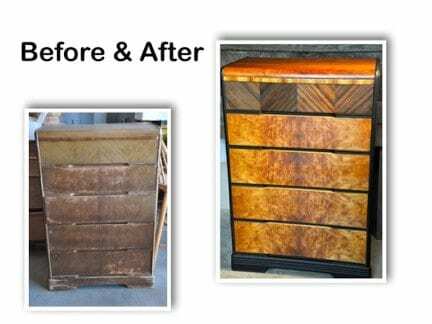 Moral of the story-buy quality reused, restyled furniture that will look fantastic in your home, feel good you did your part for the environment and you bank account! Thanks a ton for reading our spiel.